Kevin Walter was a 7th round pick of the New York Giants back in 2003 out of Eastern Michigan. Unable to make the roster of the Giants the Bengals snapped him up off of waivers. Walter would play primarily on special teams as his playing time increased over the next 3 seasons. In 2005, he’d start two games and log 19 receptions for 211 yards for the Bengals. The offseason would start with Walter being a restricted free agent and the Texans would quickly pay the bargain price of a 7th rounder to get Kevin from the Bengals. (Being that Walter was from the same draft as Andre Johnson, it is inferred that the Texans really did their homework on wide receivers that year with an unusually deep class at the position.) While 2006 would be more of the same for Walter, he’d quickly work himself up the depth chart in 2007 opposite Andre Johnson with new starting quarterback Matt Schaub in the lineup. As injuries would limit Johnson’s production, Walter would step up and become the primary receiver for the majority of the season logging career highs in all receiving categories. He’d follow 2007 up with a just as productive 2008 making personal career highs in all receiving categories with 60 receptions for 899 yards, 15.0 average, 61 long and 8 touchdowns. As he plowed into 2009, optimism was high that the Texans would have 2 1000 yard receivers, but nagging injuries would limit Walter’s production to 14 games, and he’d log 611 yards and 2 touchdowns. In the offseason, the Texans resigned him insisting he was part of their overall strategy (over rumors that he wanted to sign with the Giants,) to a fairly lucrative contract, and his 2011 was a slight rebound off of his previous season with 5 touchdowns and 621 yards. Walter has experienced exponential growth as a receiver over the past few seasons in Houston and has even been praised by former teammates in Cincinnati. Overall he is considered one of the team’s smarter pickups and is ranked second All time on the Texans’ receiving charts behind Andre Johnson in yards, receptions, and touchdowns by a hair over teammate Owen Daniels. A precise route runner with extremely good hands, Walter is continued to be expected to work opposite Johnson for the foreseeable future. Score 2009 cards are great. I really like the framing and design of the cards. They lack the perceived border restriction that a lot of cards have, while the design is current and relative with the splattered ink style. The delivery of the important information about the player is clever, yet slightly understated, and the photography is strong. Something that I’ve never understood is why card companies make high glossy cards, because isn’t the other function of these cards other than collecting them, is to get them signed? (So the ink never completely set on this card but did dry because of the gloss.) Oh well. Walter is a great sleeper still in many deeper Fantasy Football leagues. If I can I typically take a flyer on him in the latter rounds or even luckier on waivers. 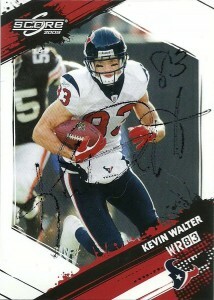 I was told that Walter loves receiving football cards, collecting all his own, and even likes fan art. Below are his statistics through the 2010 season.